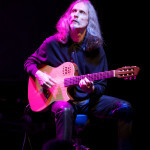 Born in 1956 in Paris, François Szönyi discovers rock music in 68, starts to play guitar in 69 with a jazz guitarist passing through Monaco at the moment, buys an electric guitar and creates the band Dies Irae, an ensemble of arty-progressif rock which gradually will become tinged with jazz. He will discover this music in an atypical way, with Pharoah Sanders and Larry Coryell, in 71. The same year sees his public first steps, then concerts follow, authorised or forbidden, in the MJCs, universities or « pop festivals ». In 75 the Golf Drouot, the temple of rock in Paris, awarded a prize to the band. Through this experience he moves on improvisation and composition, in musical fields going from rock to free jazz, to free improvisation, and brings out the taste for group musical practice. In 1975, wishing to be able to study more structured musical fields, he registers at theAcadémie de Musique in Monaco, attends the classical guitar course of Pier Domenico Amerio, adisciple of Andres Segovia and Alirio Diaz, and receives a first prize for the Supérieur level and for the Proficiency level. Otherwise he is interested in instrument making and gets a Certificat d’Exécution for the making of two violins in the midst of this academy. 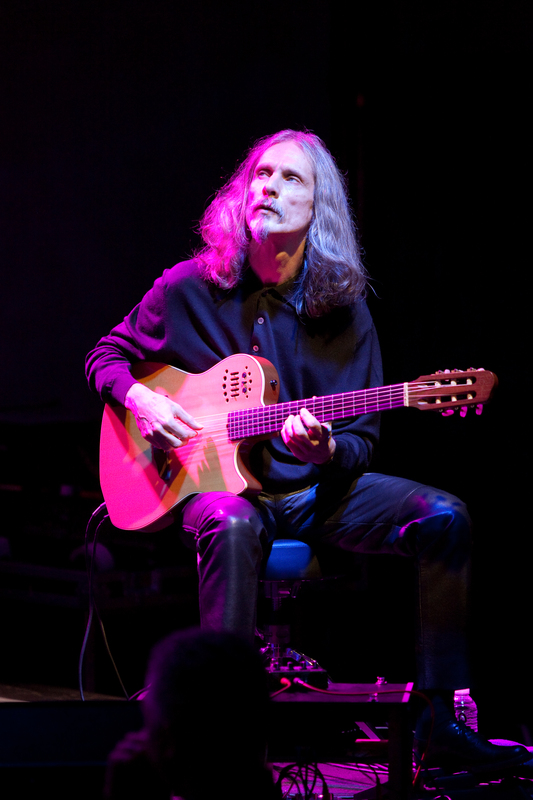 In 1979, his interest for acoustic instrumentation, his taste for the stage and the music in group lead him to found the Aighetta guitar quartet. This experience will lead him to play in the whole Europe, from alternative networks to the most prestigious concert halls, to work with musicians and composers such as John McLaughlin or Anthony Burgess, the author of Clockwork orange. He composes, arranges, transcribes and carries out researches about the repertoire for Aighetta, records numerous albums. Interested by popular musics he plays at the end of the 70’s with an estudiantina (tours in Europe and in Africa) and at the beginning of the 80’s with I Giorni Cantati ; an Italian popular music ensemble ; more recently he accompanies Julia Migenes on electric guitar in West side story. In 2006 he creates the Dies Goa Unit trio, a summary of electric, acoustic, recording and stage experiences, between acoustic and electronic, jazz, rock, world and chamber music. In 2011 he creates the chamber music ensemble Flores Vallis with, on violin, his two children At the same time, holding two Ph.D, he manages researches in university then industrial environment, is elected in 1995 a member of the New York Academy of. Sciences.